Home Press Release Jollibee is digital engagement leader among QSRs in PH! 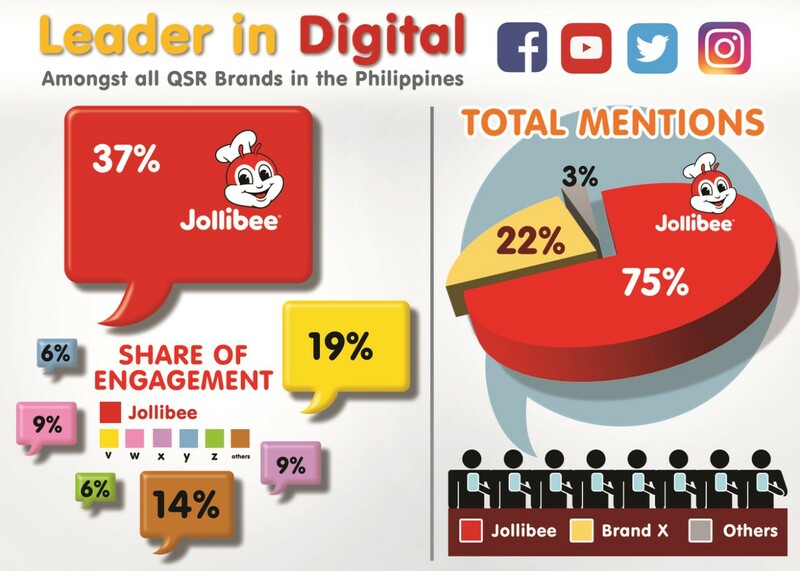 Jollibee is digital engagement leader among QSRs in PH! The Philippines’#1 fast-food chain is also #1 in digital engagement. For decades, Jollibee has been capturing the taste buds of Filipinos with its langhap-sarap treats. Lately, the brand has been winning over the hearts of millions online withhit-after-hit digital content. According to a report by Community Plus, a social listening tool used by various global brands, from January to June 2017, Jollibee outranked all other brands in the quick service restaurant category, particularly in Facebook where it garnered a majority 37% share of engagement, twice greater than its biggest foreign competitor. Social media intelligence toolThoughtbuzz also reports that Jollibee is the #1 most talked about QSR brand, registering 1.5 million mentions in various digital platforms; almost triple that of its competitors in the same period. The brand’s original short-film series, Kwentong Jollibee, has gone viral multiple times this year, and has earned multiple accolades not only from netizens but from industry leaders globally. In February, the highly-evocative “Vow”, “Date”, and “Crush” Valentine’s videos successfully wooed the online audience with over 50 million views on Facebook and YouTube, about 1.3 million shares, 7.5 million in engagement, and 82 million reach (72% organic reach). The buzz of Kwentong Jollibee’s Valentine series generated over P150 million in free PR and media values as well. The viral success of the Kwentong Jollibee episodes continued towards mid-year with “Parangal” and “Powers”—back-to-back moving tributes to the sacrifices of moms and the heroic deeds of dads, to provide a comfortable life for the family—as the Mother’s Day and Father’s Day videos garnered positive reactions from netizens and received 8.1 million and 7 million views, respectively. The Kwentong Jollibee series’ most recent viral hit, “Apo” is proof not only of the enterprise’s sustained success but of Jollibee’s digital content mastery. A Grandparents’ Day special, “Apo”follows a young man recalling his happy childhood memories ashe makes his way back home to the embrace of his “second parents”. With a whopping 29million reach, over 14.2million views and an engagement of 1.1 million, Jollibee’s special grandparents’ day tribute solidified the brand’s online leadership. The most recent viral short film was coupled with a heart-tugging CSR effort, Grand Thank You Project, and a special video feature titled“Handog para kay Lola Belen”. The project recognizes hardworking grandparents and gives back the love with a Grandparents’ Day feast for their family and other forms of support such as financial aid. On the Grand Thank You Project’s second year, Jollibee features Lola Belen, a grandmother from Pangasinan who tirelessly sells local delicacies at a nearby Jollibee branch to provide for her loved ones. The video feature reached over 7.7 million netizens and 5.2 million views. Apart from the emotional Kwentong Jollibee short films, Jollibee has also produced a number of successful online campaigns that have gotten netizens abuzz: from the impressive dance skills of the lovable mascots Jollibee and Friends in the JolliDance Showdown series with more than 29 million Facebook and YouTube views, the quirky quick escape tricks of JolliSavers for every Petsa de Peligrothat reached more than 24 million views, to the sumptuous and heartwarming Chickenjoy campaigns that generated more than 28 million views. Jollibee also introduced digital engagement innovations such as the Twitter Intercept, which uses social listening to be able to suggest various Jollibee products depending on day part and topic. This exercise rendered a 50% growth in conversation and craving for Jollibee and its products on Twitter. The brand also launched the JolliDance Showdown App—the first augmented reality experience in the local QSR industry. With the free app, kids can turn the Jolly Joy Box of their Jolly Kids Meal into an interactive platform to bring to life a dancing Jollibee, compose their own dance tunes, and personalize their avatars for a unique augmented reality experience. To date, the app has registered more than 100,000 downloads. Together, these efforts have led to astounding share of voice and share of engagement results across the QSR market for Jollibee on the digital platform. There are definitely more exciting digital content from Jollibee to look forward to in the coming months. Make sure to follow Jollibee on Facebook, on YouTube , and stay updated on Jollibee’s viral hits on Instagram and Twitter.